This feature article was written by Ralph Windsor, DAM News editor and Project Director of DAM consultants, Daydream. This is second article in this series. The preceding one is: Attributes of Effective DAM Consultants – Experience. In the previous article in this series, I examined experience as an attribute of effective DAM consultants and considered this across four major areas: technical, implementation, operations and strategy. In this item, I will assess expertise across the full DAM initiative lifecycle as the next most significant attribute that DAM consultants need to have. This is closely related to experience, but is less concerned with what a consultant might or might not have done in the past and more whether they can add value in the present. What is the Lifecycle of a DAM Initiative? Awareness of issues relating to the management of digital assets. Analysing the current DAM provision. The first element of the above may occur within the context of a broader initiative (e.g. Digital Transformation) or it might be simply digital asset users becoming aware that there are more efficient methods available. The remaining items can be roughly summarised as before, during and after. I consider each of them (and the expertise needed) below. Digital Asset Management ROI assessment and developing a business case. Identifying collections of existing digital assets. Placing DAM within the wider context of other initiatives (e.g. Digital Transformation). DAM ROI assessment is a far more complex and multi-dimensional subject than many understand. The simplistic methods of calculating it are unfit for purpose and tend to lead DAM users down blind alleys which cost them more than they save. Most DAM ROI is incremental in-nature and composed of fractional savings which accumulate and compound over an extended period. In many cases, DAM ROI will be negative when DAM is introduced before organisational culture changes take hold and this can cause disillusionment among some users. Consultants with full DAM lifecycle expertise will be aware of this and can set expectations (and benchmark metrics) accordingly. Closely related to ROI is risk management. Those with formal training in project management usually have an understanding of this topic, however, like all specialist subjects, the context is critically important and just knowing about generic project management considerations is insufficient. To put it in simpler terms, you need both project management and DAM expertise to be a DAM consultant, so a mix of technical, operational, strategic and implementation experience is essential to identify risks and develop mitigation plans. In addition to the topics mentioned, there are a range of other activities, like auditing DAM provisions and discovering what digital assets exist and entire ‘hidden’ DAM systems which have been in-use but were not known to the primary stakeholders. Pre-implementation DAM consulting requires the full range of experience to not only ask the right questions, but understand the answers. Planning user adoption and change management strategies. Developing project briefs for vendors and other internal or external suppliers. Organising initial and follow-up demonstrations with vendors. Managing selection processes (including shortlisting). Reviewing contractual issues and commercial service delivery agreements. Negotiating costs and getting best value. Devising metadata schema and taxonomies. Workflow processes and their relationship with creative operations. Testing metadata schema and reviewing the results. Planning data migration and ingestion of initial batches of digital assets. Plans for automating metadata generation and/or arranging cataloguing. Reviewing the proposed digital asset infrastructure (delivery and processing). Scaling plans and identifying thresholds and/or scaling risks. Assessing what auditing, reporting and analytics tools need to be in-place. Developing an implementation stage risk management plan. Establishing quality metrics and benchmarks for measuring the success of the implementation. Developing training materials and internal communications. As should be apparent, there is a lot to think about with a typical DAM implementation. To be an effective DAM consultant technical, implementation, strategic and operational experience is required to a greater or lesser extent with every single one of the above areas. While the list is fairly in-depth, it still isn’t everything and does not begin to cover subsidiary considerations which may emerge as DAM initiatives progress. Is the DAM being used as much as was expected? Is there one group of users who are over or under-represented? What is the trend in terms of usage? Is it up or down? Are there patterns like seasonal variations or other causal factors impacting usage? Are the number of assets on the system increasing and how quickly? What is the search/download ratio? What is anecdotal evidence about DAM usage and ow does this compare with quantitative studies? Are there issues being reported by different groups of users? What is preventing asset owners from ingesting assets? As with the other stages, there is a mix of strategic, technical, operational and implementation factors which affect the answers to the above questions and they are frequently relate to each other. As described earlier, DAM solutions generate exponential positive and negative ROI so seemingly unimportant technical details can snowball into significant issues which limit the number of assets uploaded and users logging in. Inexperienced consultants will recommend wholesale replacement of the solution, those with more expertise will want to get to the bottom of the root cause of the problem to discover if it can be resolved before the risk and expense of a replacement is commissioned. As readers would imagine, the same works in-reverse also. If the strategic focus of the DAM was on something that would never generate ROI in the first place, it doesn’t matter how technically brilliant a given product is. As should be obvious, the post-implementation stage is a moving target and user perception of a DAM will change significantly over the lifecycle. This is not a one-off activity that can be carried out six months after initial deployment. The different facets of the experience which DAM consultants must possess and which was talked about in the previous article are distributed across the stages above. Certain aspects are more associated with one stage rather than another. For example, technical experience tends to be important in the implementation stage, however, they are not the exclusive realm of one over another and strategic or operational expertise (or lack if it) can have implications which ripple out for months or years afterwards. What should be clear from this analysis is that one type of expertise frequently needs to be applied to help inform another. Acquiring experience alone is not sufficient to be an effective DAM consultant, it is necessary to apply it both within the current area under discussion but potentially any number of others also. A number of years ago, I worked with a consultant who could seamlessly switch between a discussion about some strategic objective of a client’s business with C-level executive to an in-depth conversation about video codecs with technicians (and then relate the two conversations back to each other). An effective consultant needs to be able to apply their experience and knowledge by scaling up or down their mental model of a subject, like a magnifying glass (and without needing to think about it). A comparable skill is the way that people who can fluently speak multiple languages are able to effortlessly switch between them, sometimes mid-conversation. On the occasions I get asked to assess other consultants for clients, this is what I tell them to look for and when I am required to deliver DAM consulting training, I advise students that this is what they should strive to be able to do in order to add the most value they can to a DAM initiative. 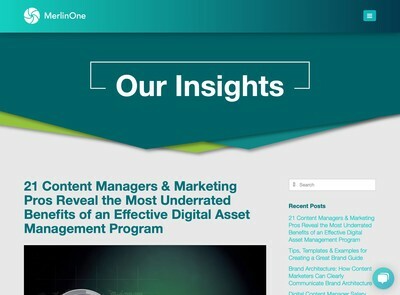 As a subject, digital asset management is complex, demanding and frequently undervalued. To an extent this is changing now, but IT personnel historically regarded it as ‘photo library stuff’ and not ‘business-critical’. 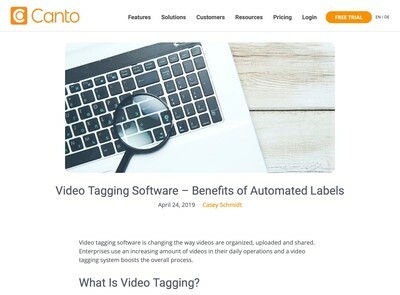 The fact DAM systems are now embedded into enterprises and frequently get used as hubs for operations involving rich media has gradually altered that perception, along with the increased demand from departments with more internal clout (e.g. marketing). With that said, the lack of differentiation between vendor solutions has also contributed to the view that because so many of the systems appear to be homogenous, the problem must be one that is ‘solved’. 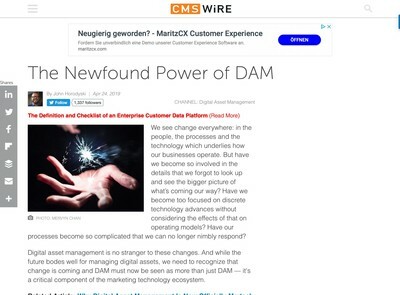 The reality of the DAM software market is that most of the ROI (and therefore the majority of the required work) is generated by the users, not the software, this is contributory to why there is so little innovation in DAM now. 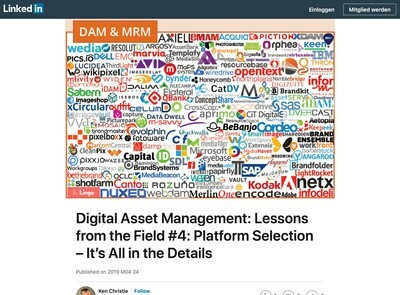 There is only a limited extent to which DAM systems can practically help with your Digital Asset Management problems and the gap between what is promised and what needs to be done to get some useful results from them is one a DAM consultant is supposed to help you to fill. When any discipline has the word ‘management’ included in its title, what this really means a problem which you cannot fully solve, hence a term like ‘pain management’ implies it will still hurt, but not as much as it might have done otherwise. This is the unvarnished truth about DAM consulting, an effective consultant can help you deal with the thorniest aspects of the problem, but they still might not be able to fix everything for you. As well as expertise and experience, therefore, a further essential attribute of effective DAM consultants is absolute honesty about what they can do for you and the necessity for you to be an active participant in the process in order to get the maximum benefit from your investment into a Digital Asset Management initiative.